The Gnome Display Manager (GDM) uses Wayland as the default display server in Red Hat Enterprise Linux 8, replacing the X.Org server that was used with Red Hat Enterprise Linux 7. However, the X.Org server is still available. Wayland is a protocol for a compositor to talk to its clients as well as a C library implementation of that protocol. The compositor can be a standalone display server running on Linux kernel modesetting and libinput input devices, an X application, or a Wayland client itself. The clients can be traditional applications, X servers (rootless or fullscreen), or other display servers. For more details, refer to http://wayland.freedesktop.org. New installations of Red Hat Enterprise Linux 8 automatically use Wayland as the display server. When upgrading from Red Hat Enterprise Linux 7 to Red Hat Enterprise Linux 8, the current display server setting is inherited. If you previously used X.Org, it is automatically set as the default server in Red Hat Enterprise Linux 8. Red Hat Enterprise Linux 7 used the evdev driver as the default driver for input devices. By default, Red Hat Enterprise Linux 8 uses the libinput driver, which also replaces the Synaptic driver. For backward compatibility for certain devices, you can switch to X.Org if necessary as described in Section 1.1.3, “Switching to X.Org”. X.Org still uses evdev as a fallback for devices that are not compatible with libinput. This fallback is automatic. X.Org in Red Hat Enterprise Linux 8 also uses libinput as the default driver, and only switches to evdev in cases of incompatible input devices. In addition, the wacom driver remains the primary driver for Wacom devices. Switching workspaces by dragging up or down with four fingers. Opening the Activities Overview by bringing three fingers closer together. Proprietary Nvidia binary drivers are not supported on Wayland. To avoid any complications while using the Nvidia GPU, switch to X.Org as described in Section 1.1.3, “Switching to X.Org”. Nouveau is still supported and is the default driver for Nvidia graphics. Screen sharing and screencasting are currently not available on Wayland because the VNC protocol, which supported this functionality, is deprecated in Red Hat Enterprise Linux 8. This functionality is still available on X.Org. However, the screen sharing user service pipewire needs to be installed (pipewiere rpm) and running. For more details, refer to PipeWire project. Due to these limitations you may need to switch to the X.Org display server as described in Section 1.1.3, “Switching to X.Org”. Multiple GPU support is not available. X.Org screen manipulation utilities are not available. The xrandr utility is not supported since Wayland handles layout, rotations, and resolutions differently. The GNOME Shell cannot be restarted using the ALT+F2/r method. Due to stability issues, using X11 instead of Wayland is recommended in virtual environments. Due to current Wayland limitations described in Section 1.1.2, “Current Wayland Limitations”, you may want to switch to the X.Org display server. From the login screen (GDM), click the cogwheel next to the Sign In button. You cannot access this option from the lock screen. 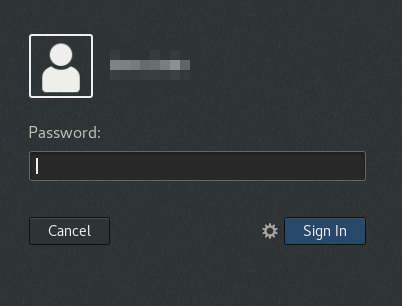 The login screen appears when you first start Red Hat Enterprise Linux 8 or when you log out of your current session. From the drop-down menu that appears, select Standard (X11 display server) on Xorg or Classic (X11 display server). Desktop icon functionality has been removed with Nautilus version 3.28, since Nautilus is no longer maintaining the desktop. By default, no desktop icons are displayed. If you want to use this functionality, install and enable the desktop icons gnome-shell extension provided by the gnome-shell-extension-desktop-icons rpm. dconf has two different meanings. Firstly, dconf is a key-based Binary Large Object (BLOB) database for storing GNOME configurations. dconf manages user settings such as GDM, application, and proxy settings, and serves as the back end for GSettings. Secondly, dconf is a command-line utility which is used for reading and writing individual values or entire directories from and to a dconf database. GSettings is a high-level API for application settings which serves as the front end for dconf. gsettings is a command-line tool which is used to view and change user settings. Administrators can define default settings that apply to all users. Users can override the defaults with their own settings. Administrators can also lock settings to prevent users from overriding them. 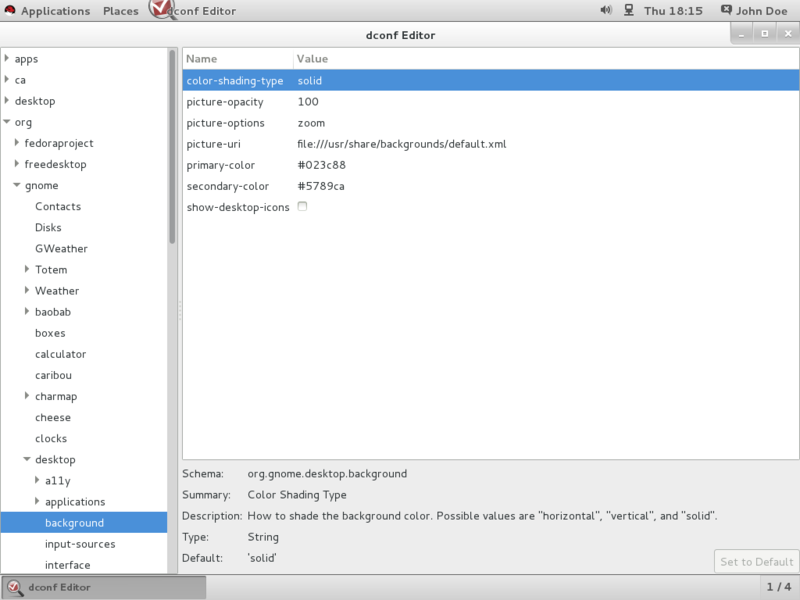 The dconf-editor provides a GUI for browsing the settings and their editing. It presents the hierarchy of settings in a tree-view and also displays additional information about each setting, including the description, type and default value. For more information on the dconf-editor tool, see the dconf-editor(1) man page and the dconf-editor Project documentation. For more information on the gsettings utility, see the gsettings(1) man page. A dconf profile is a list of system’s hardware and software configuration databases, which the dconf system collects. The dconf profiles allow you to compare identical systems to troubleshoot hardware or software problems. The dconf system stores its profiles in the text files which can be located either within the /etc/dconf/profile/ directory or elsewhere. The $DCONF_PROFILE environment variable can specify a relative path to the file from /etc/dconf/profile/, or an absolute path, such as in a user’s home directory. Note that key pairs which are set in a dconf profile override the default settings. If set, dconf attempts to open the profile named in the variable and aborts if this step fails. If not set, dconf attempts to open the profile named user and uses an internal hard-wired configuration if this step fails. Each line in a dconf profile specifies one dconf database. The first line indicates the database used to write changes. The remaining lines show read-only databases. In this example, the dconf profile specifies three databases. user is the name of the user database which can be found found in ~/.config/dconf, and local and site are system databases, located in /etc/dconf/db/. To apply a new dconf user profile to the user’s session, you need to log out and log in, because the dconf profile for a session is determined at login. As a user or application developer, do not manipulate dconf directly. To manipulate dconf, always use the dconf-editor or the gsettings utility. The only exception to use dconf directly is when setting system-wide default configurations, because the aforementioned tools do not allow to manipulate such configurations. Machine-wide default settings can be set by providing a default for a key in a dconf profile. These defaults can be overridden by the user. where local is the name of a dconf database. "none", "wallpaper", "centered", "scaled", "stretched", "zoom", "spanned"
Determines how the image set by wallpaper_filename is rendered. BURI to use for the background image. Note that the backend only supports local file:// URIs. Left or Top color when drawing gradients, or the solid color. Right or Bottom color when drawing gradients, not used for solid color. Edit the keyfile according to your preferences. For more information, see Section 2.3, “Displaying GSettings values for desktop applications”. When the user profile is created or changed, the user needs to log out and log in again before the changes will be applied. If you want to avoid creating a user profile, you can use the dconf command-line utility to read and write individual values or entire directories from and to a dconf database. For more information, see the dconf(1) man page. By using the lockdown mode in dconf, you can prevent users from changing specific settings. Create a locks subdirectory in the keyfile directory such as /etc/dconf/db/local.d/locks/. Add any number of files with keys that you want to lock into this directory. Without enforcing the system settings using a lockdown, any settings that users make take precedence over the system settings. User can thus override the system settings with their own. Create a new /etc/dconf/db/local.d/locks/ directory. For dconf to work correctly when using Network File System (NFS) home directories, the dconf keyfile back end must be used. Note that dconf keyfile back end only works properly if the glib2-fam package is installed. Without this package, notifications on configuration changes made on remote machines are not displayed properly. With Red Hat Enterprise Linux 8, glib2-fam is available in the BaseOs repository. Ensure that the glib2-fam package is installed on the system. Create or edit the /etc/dconf/profile/user file on every client. The dconf keyfile back end takes effect the next time that the user logs in. It polls the keyfile to determine whether updates have been made, so settings may not be updated immediately. This section describes how to set GSettings keys properties for a single-logged user. Each GSettings key can have only one value in a dconf database. Setting the same key to a different value at a different place of the dconf database overrides the previous value. Values of some keys are of array type. For array type, you can specify the value of the key as a list of multiple elements separated by a comma. This section focuses on using of the gsettings command to configure, manipulate and manage the GSettings keys. The most frequent use cases that can be resolved by using the gsettings command are shown. Note that the value is specified as a serialised GVariant. $ gsettings set org.gnome.shell favorite-apps "['firefox.desktop', 'evolution.desktop', 'rhythmbox.desktop', 'shotwell.desktop', 'org.gnome.Nautilus.desktop', 'org.gnome.Software.desktop', 'yelp.desktop', 'org.gnome.Terminal.desktop', 'org.gnome.clocks.desktop']"
If the operation succeeds, no return code is shown. As a result, all listed applications are added to favorite applications. The change is valid immediately. Note that if the KEY argument is not specified, all keys in the schema are monitored. Monitoring continues until the process is terminated. $ gsettings set org.gnome.shell favorite-apps "['firefox.desktop', 'evolution.desktop', 'rhythmbox.desktop', 'shotwell.desktop', 'org.gnome.Nautilus.desktop', 'org.gnome.Software.desktop', 'yelp.desktop', 'org.gnome.Terminal.desktop']"
As a result, the return code shows True. As a result, the return code displays type of the key value, which is type b in this particular case. For more information, see GNOME developer. URI to use for the background image. Note that the backend only supports local file:// URIs. Note that the value is displayed as a serialised GVariant. As a result, the return code displays false. If resetting succeeds, no return code is displayed. Default values are in stored dconf and gsettings-desktop-schemas files. The default value of the lock-delay key is 0, and it is stored in the /usr/share/glib-2.0/schemas/org.gnome.desktop.screensaver.gschema.xml file. Users can set the value of lock-delay as needed. As a result, the value of lock-delay value is set to 0. As a result, the lock-delay value is reset to 0, and other keys within the org.gnome.desktop.screensaver schema that were changed by user are reset to their defaults as well. If the [--print-paths] argument is specified , the path where each schema is mapped is printed as well. As a result, a full list of schemas is returned. The following list is truncated. As a result, a list of keys is returned. The following list is truncated. Note that the list is empty if there are no children. Note that if the schema whose keys you want to list is not specified, all keys within all schemas are listed. As a result, all key and values in all schemas on system are listed, as shown below. Note that the following list is truncated. Certain portions of this text first appeared in the GNOME Desktop System Administration Guide. Copyright © 2014 The GNOME Project, Michael Hill, Jim Campbell, Jeremy Bicha, Ekaterina Gerasimova, minnie_eg, Aruna Sankaranarayanan, Sindhu S, Shobha Tyagi, Shaun McCance, David King, and others. Licensed under a Creative Commons Attribution-ShareAlike 3.0 Unported License. The editors of this Red Hat Enterprise Linux 8 documentation would like to thank the GNOME community members for their valuable contributions to the GNOME Desktop System Administration Guide.